This matter comes before the Court on plaintiffs' complaint for a declaration that plaintiffs are the sole and rightful owners of certain waterpipes, for an injunction restraining the defendants from using said waterpipes and for an accounting for water used. The defendants claim that they have an easement by grant or implication for water and sewage across the plaintiffs' premises. The plaintiffs' request for a preliminary injunction restraining defendants from using the water pipe was denied on September 14, 1977. A trial was held on December 6, 1977 at which two witnesses testified and one exhibit was introduced. The parties submitted a stipulation of facts with 10 accompanying exhibits. All testimony, stipulations and exhibits are incorporated herein for the purpose of any appeal. Plaintiff Moise Elghanayan, a/k/a Maurice Elghanayan, Trustee of the Elga Realty Trust (hereafter Elghanayan) is the owner of certain premises in West Roxbury, Massachusetts known and numbered as 41 and 55-57 Broadlawn Park upon which are located two apartment buildings. Plaintiff Fineberg is the lessee of the above premises. Defendant James H. Styers, Trustee of Wachovia Realty Investments and defendant Elaine LoPresti, Trustee of Wachovia Realty Trust, (hereafter jointly referred to as Wachovia) are in possession as foreclosing mortgagee of premises known and numbered as 50-56 Broadlawn Park upon which is located an apartment complex, Delegate North. Wachovia claims it has an easement over plaintiffs' premises for water and sewage. Defendant Quintin Vespa (Vespa) and defendant Linda M. Bavuso, Trustee of Kingston Realty Trust are predecessors in title to Wachovia. There are two issues to be resolved. First it must be determined whether defendants have an easement for water and sewage extending approximately along the northwest boundary of petitioners' parcel 2 and then under Broadlawn Park as it runs easterly and then southerly to a cul de sac, all as shown on Appendix A. Implicit in this determination is whether the defendants have the right to use the existing pipes located therein. The second issue concerns the damages petitioners have sustained from the defendants use of water and nonpayment for same. In 1970, Edison Park, Inc. was the owner of four abutting parcels comprising the property now occupied by Fineberg and Wachovia. The stock of Edison Park, Inc. was wholly owned by defendant Vespa. (Tr. 20-21). On parcels 1, 2 and 3 were located the two apartment buildings now leased to Fineberg. Parcel 4 was vacant. These apartments had been constructed by Vespa. He had also laid a water pipe to serve these apartments located approximately along the northwest boundary of parcel 2 and then continuing east and south underneath the center of a private drive, Broadlawn Park, terminating at the center of a cul de sac at a hydrant. The pipe as installed by Vespa was an 8 inch one in size as designated by the water department of the City of Boston, based on the number of units planned for the entire area. (Tr. 39-40). 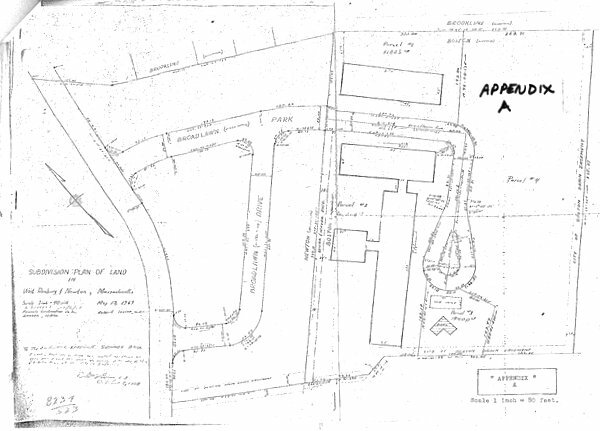 Parcels 1, 2, 3 and 4 are shown on a plan attached hereto as Appendix A, which is a copy of a plan recorded in Book 8234, page 523 Suffolk Registry of Deeds and exhibit C of the parties' stipulation. "There is appurtenant to said Parcel #4 the right to use Broadlawn Park, as shown on said plan, for all purposes for which public streets and ways are or may be commonly used in said Boston, in common with those from time to time entitled to the use thereof." Vespa later constructed an apartment house on Parcel 4 called "Delegate North". Water service for this building was then connected into the water pipe running under Broadlawn Park without the installation of a water gate or meter. It is from this use of the water pipe that the dispute stems. Lot 4 and its appurtenances came into Wachovia through a mortgage foreclosure. Thus, there is no specific mention in the deeds in defendants' chain of title to lot 4 to either the "sewer and water ease." or the right to use the existing water pipes. However, the Court concludes, for reasons to be discussed, that the defendants have as appurtenant to lot 4 a water and sewer easement and the right to use the existing pipes located approximately along the northwest border of lot 2 and in Broadlawn Park. The basis of the Court's conclusion rests on the doctrine of implied easements. The origin of an implied easement must be found in the presumed intention of the parties to be gathered from the instruments when read in light of the circumstances attending their execution, the physical condition of the premises, and the knowledge which the parties had or with which they are chargeab1e. Labounty v. Vickers, 352 Mass. 337 , 344 (1967); Dale v. Bedal, 305 Mass. 102 , 103 (1940). First, what was the presumed intention of the parties to be gathered from the instruments when read in light of the circumstances attending their execution? The water pipes were installed under the area marked "sewer and water ease." along the northwesterly side of Lot 2. The pipes had also been installed in the existing way shown as Broadlawn Park. In some circumstances the grant of a right to use a way for all purposes for which public streets and ways are commonly used carries with it the right to use existing sewers and drains under the principle that the grant of an easement is usually in reference to the existing state of the premises. See Beals v. Brookline, 245 Mass. 20 , 24 (1923). Here, as in the Beals case, the existing state of the way at the time of the conveyances included the water pipes under its surface. This circumstance must be weighed to determine whether an implied easement exists. In addition, the deed from Vespa to Elghanayan refers to a plan (Appendix A) entitled "Subdivision Plan of Land in West Roxbury and Newton, Massachusetts," dated May 19, 1967 revised October 2, 1968, by Robert Levine, C.E. This same plan is also referred to in the deeds to Wachovia's predecessors in title. (Exhibits E, F). It contains the words "sewer & water ease." within a 15 foot strip on the northwestern boundary of parcel two. Evidence was introduced at trial that the single water meter is located in the vicinity of the southwest corner of parcel two. The water pipe runs from there through the area marked "sewer & water ease." approximately along the Newton border to the center of Broadlawn Park and thence easterly and southerly over Broadlawn Park to a hydrant at the cul de sac. Thus the water pipe is in approximately the location of the easement shown on the plan. A plan referred to in a deed becomes a part of the contract insofar as may be necessary to aid in the identification of the lots and to determine the rights intended to be conveyed. Labounty v. Vickers, 352 Mass. 337 , 344 (1967); Bacon v. Onset Bay Grove Association, 241 Mass. 417 (1922). While the notation "sewer & water ease." on the plan is ambiguous as to the parcels to be served by the easement, the Court concludes in light of the geography of the area and the parties' knowledge that the easement was intended to and does serve parcel four. Secondly, the physical condition of the area itself, known to both parties, shows that Parcels 1, 2, 3, and 4 were a closed area, a small parcel of land separated from other buildable land by a swamp. (Tr. 39-40). Broadlawn Park, underneath which are the water pipes, is conveniently laid out so as to be accessible to all four parcels. The existence of the water system is physically apparent to an observer. The hydrant in the cul de sac at the end of Broadlawn Park indicates water pipes run at least that far and the service can be seen when manhole covers are lifted. (Tr. 9). Thus, the physical layout indicates both that parcel 4 was intended to be benefited by the sewer and water easement and that such a service as located was reasonably necessary for the use and enjoyment of parcel 4. Lastly, the Court turns to the knowledge of the parties at the time of the sale of lots 1, 2 and 3 to Elghanayan. Before the sale was consummated Vespa and Elghanayan and his father went upon the land and had conversations on at least two occasions. The plaintiff objected to the admissibility of these conversations on the basis of the parol evidence rule, that conversations cannot be introduced to vary the terms of the deed. The Court has determined that the parol evidence rule is not applicable here, because the determination whether the deed of parcels 1, 2 and 3 to Elghanayan carried with it by implication a reservation of an easement does not depend entirely upon the construction of the language of the deed. Rather, the deed must be construed with reference to all the facts within the knowledge of the parties in reference to the subject matter of the grant in order to determine and effectuate the presumed intention of the parties. Jasper v. Worcester Spinning & Finishing Company, 318 Mass. 752 , 758 (1945). The Court concludes this evidence is admissible to show the knowledge with which the plaintiffs are chargeable and to aid in the construction of the reservation of a "sewer and water ease." by showing to what parcels the easement applied. Jasper, supra, 759. Plaintiffs argue that a necessary precondition to the existence of an easement by implication is that the use claimed be in existence and open and apparent at the time of the severance of the servient and dominant tenements. It is true that in 1970 at the time of the conveyance of lots 1, 2 and 3 to Elghanayan, construction had not been commenced on Delegate North and so of course there was no pre-existing use by lot 4 of the water pipes. But while existing use is a relevant factor to consider, it is not essential to the existence of an easement by implication. Restatement, Property, §476 comment g (1944). It is not the only factor to be considered. Implied easements cannot arise out of the needs of one of the parties of which the other has neither knowledge nor notice. Dale v. Bedal, 305 Mass. 102 , 104 (1940). Thus, a pre-existing open and apparent use is relevant to the extent it bears upon notice, id., 104 but it does not follow that a pre-existing use is the only means of importing the requisite notice. "The fact that such knowledge was given is the thing that is important rather than the means by which it is imparted." Jasper v. Worcester Spinning & Finishing Company, 318 Mass. 752 , 759 (l945). The Court concludes that Elghanayan received the requisite notice of the easement from the geography of the area, from the notation "sewer & water ease." on the plan and from his conversations with Vespa. Thus, the Court finds that an easement by implication to use the existing water pipes was created in defendant Vespa and is now held by Wachovia. The second issue to be determined is the amount of damages due to the plaintiffs for the use of water. Since the defendants have been held to have an implied easement herein, the use of this easement and the pipes therein to obtain water must also be determined. The water meter is located in the vicinity of the southwest corner of lot 2. Thus, water used by both the Broadlawn Park Apartments and Delegate North pass through this meter, but plaintiffs have been billed for all water used. Defendants admit their obligation to pay for the water consumed by them, but there is a disagreement over the formula to be used in calculating the parties' relative liabilities. As there is no separate water meter at the Delegate North tie in, it is impossible to determine precisely how much water has actually been used by that apartment. Plaintiffs argue defendant should pay 43% of the water bills from the time of Delegate North's construction to October 14, 1977 (at which time the parties made other arrangements pending the outcome of this action). This percentage is arrived at by calculating what the ratio of the number of units in Delegate North (110) bears to the total number of units in all the buildings served by the water pipe (255). Defendants argue in turn that payment should be based on the number of units actually occupied. There are difficulties with both of these formulae. The problem with the plaintiffs' formula is that the total number of apartments existing in Delegate North bears little relationship to the amount of water actually used by that building because the occupancy in Delegate North has varied from 10 units in September 1975 to 80 units in October 1977. The difficulty with the defendant's formula based on occupied units is that it makes no allowance for water used during the construction of Delegate North. A further problem with both formulae is they do not take into account variations which may exist in water usage between plaintiffs' and defendants' buildings owing to such differences as the types of air conditioning systems in use. (Tr. 12). However, insufficient evidence on these potential differences or their scope has been presented and hence the Court 18 unable to take them into account. Henceforth, Wachovia will be required to install a water meter if it has not already done so, so that its precise usage will be determinable. The Court's calculation of damages is based upon occupied units with an allowance for water used in construction. A further problem is presented by the absence of actual water bills (as opposed to estimated bills) making it difficult to calculate the relative usage of Broadlawn Park and Delegate North. Estimated bills are generally based upon past performance, that is, the amount of water used in the past. When occupancy continues at a fairly constant rate, the past is a reliable indication of the future, and estimates are likely to be fairly accurate. However, when occupancy suddenly starts to fluctuate, the quarterly estimates, being based on past usage, cannot be expected to accurately reflect the amount of water actually used in that particular quarter. After 1975 there was a substantial change in the number of units, and thus the quarterly estimates are not reliable guides. For this reason the Court rejects the defendants' calculations of liability as set forth in Wachovia's brief, Appendix A and Vespa's request for finding of fact #37. Rather, the Court will base its calculations on periods covered by actual readings. The table of water bills shows that the Broadlawn Park Apartments (plaintiffs' premisesJ are estimated to have used 1600 cubic feet of water per year for each of the years 1970 through 1975. Presumably this estimate is based upon past performance. As the Broadlawn park Apartments have been substantially fully occupied at all relevant times (stipulation 2D), one would expect the apartments to have continued to use 1600 cubic feet of water in both 1976 and 1977. Thus, any volume in excess of this amount must be attributed to use by Delegate North. Proceeding to the first actual water bill where 2,143 cubic feet were used amounting to a total bill of $13,393.75 or $6.25 per cubic foot, the Court estimates the Broadlawn Park Apartments used 400 cubic feet in the quarter covering 5/19/76-8/30/76 (i.e., 1/4 ) whi1e the remainder, 1743 cubic feet, must be attributed to water used in the construction and occupancy of Delegate North from the time the tie-in pipe was first installed through August 30, 1976. Thus the defendants are responsible for 1743 cubic feet X $6.25/cubic foot = $10,893.75. [Note 1] Defendants Quintin Vespa and Linda M. Bavuso are chargeable for this amount as Wachovia was not in possession at this time. From the actual reading of 8/30/76 to 10/27/77 when the next actual reading was made we find that 2648 cubic feet of water were used during this fourteen month period, resulting in a total bill of $14,111.50 or $5.33 per cubic foot. During this fourteen month period estitaated readings were made and bills rendered. This was presumably totaled out at the time of the actual reading on 10/27/77 when 376.000 cubic feet were added to effectuate the actual use of the water for this period. The Court is at a loss to explain why no bill was rendered for the period 3/12/77 to 5/13/77. Defendants' average occupancy during this period was 74.5 units per month [Note 2] or approximately 34% of the total units since the plaintiffs had 145 average units occupied. [Note 3] Thus defendants are chargeable with 34% of the total waterbill or $4,797.91. Of this amount, $905.76 [Note 4] is chargeable to defendant Bavuso and the remainder, $3,892.15 to Wachovia. Wachovia has already made a payment of $2,039.41, to plaintiffs (Stipulation 2C) and hence now owes $1,852.74. As it has been determined the defendants used 34% of the water during this 14 month period, it follows that the plaintiffs used 66% or 1748 cubic feet in the same period. From this figure it is calcuable that plaintiffs used approximately 1498 cubic feet in a twelve month period. (12/14 (1748) = 1498). This figure, 1498, compares relatively closely with the plaintiffs' estimated use of 1,600 cubic feet for each of the years 1970 through 1974 and provides a basis for calculating the defendants' liability for the period ending 8/30/76. Theoretically, the Court could have utilized 1498 as an approximation of the Broadlawn Park apartments yearly water usage through August 30, 1976, the date of the first actual meter reading, and attributed anything in excess of this figure to use by Delegate North in construction and occupancy. The Court prefers the 1600 figure, an estimate over several years, rather than l498, a yearly average based on only 14 months experience. One further issue of damages remains. There is no water gate, valve, or shutoff of any kind from the main line to Delegate North. (Tr. 12). Thus, in the event Delegate North has a problem, it is not possible to shut off merely that building's supply; rather the supply to plaintiffs' property must be shut off. In contrast there are shutoff valves at the entrances to plaintiffs' apartment buildings. The defendants will be required as a condition to further use of the water pipes (if this has not been done already) to install seasonably a shut off valve and a meter for Delegate North and henceforth to pay plaintiffs for its use of water as measured by this meter, at the then prevailing water rates for the City of Boston. Payment may be made either directly to plaintiffs or to the City of Boston on plaintiffs' account, if the City will accept said payment. Plaintiffs' requested findings of fact 1, 2, 3, 4, 5, 7, 8, 9, 10, 11, 15, 16, 17, 19 are granted; 6, 12, 13, 14, 18, 20, 21 22, 23, 24, 25 are denied. Plaintiffs' requested rulings of law 3, 6, 7, 8, 9, 10, 11 are granted; 1 and 2 are denied. The Court does not perceive the relevance of 4 and 5 and denies those also. Defendant Vespa and Bavus's requests for findings of fact 1, 2, 3, 4, 5, 6, 7, 8, 9, 10, 11, 12, 13, 15, 20, 21, 22, 23, 24, 25, 26, 28, 30, 31, 32, 34 are granted; 14, 35, 36, 37 are denied. Numbers 16-19 bear on the precise location of the pipe and meter. The Court has made findings on the approximate location of these items and deems the evidence inconclusive to establish their exact location. Number 27 is granted as to Broadlawn Park. As for #29, the Court finds the defendants had some discussion with the plaintiffs relative to payment for water used by Delegate North. Number 33 varies somewhat from the method the Court used to assess damages and is therefore denied. Defendant Wachovia's requests for findings of fact and rulings of law 1, 2, 3, 5, 7, 9, 11, 15 are granted; 4, 6, 8, 10, 14 are denied. Numbers 12 and 13 are too restrictive of the basis upon which the Court concluded an implied easement for sewage and water was reserved for the benefit of parcel 4 and are denied for that reason. [Note 1] While this figure is in excess of that calcuable from defendants Vespa and Bavuso's formula based on occupied units, defendants made no allowance or water used in construction.
" October 1976 76 " "
" November 1976 76 " "
" February 1977 74 " "
" March 1977 72 " " "
" April 1977 71.5 " "
" May 1977 71.5 " " "
" June 1977 71 " "
" July 1977 74 " " "
" August 1977 74 " " "
" September 1977 77 " "
" October 1977 +80 " "